Empower!You presents proven programs that give older adults, people with disabilities and their caregivers the tools they need to live a better life. If a health condition or fears are limiting you, Empower!You programs provide the self-management tools to take charge of your health and your life. Programs have been tested and proven to make a difference. Taught by well-trained lay leaders and coaches, classes encourage interaction, problem solving and mutual support. All classes are FREE! Interactive workshops focus on building your skills to deal with any ongoing health conditions, including arthritis, asthma, bronchitis, diabetes, depression, emphysema, heart disease, high blood pressure, osteoporosis and other physical and mental conditions. Classes are scheduled for 2 ½ hours weekly for six weeks. One or both of the lay leaders teaching your class will have a chronic condition. Developed by Stanford University and taught with proven results throughout the world, Diabetes Self-Management and Self-Management classes can be your answer to take charge of your health and your life. 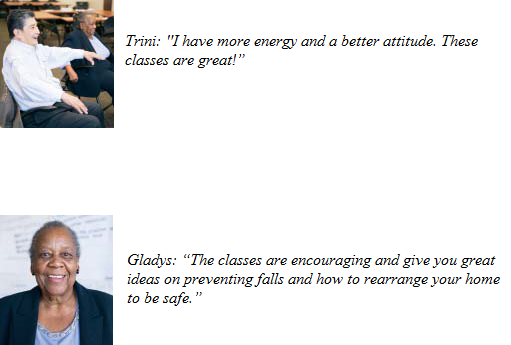 Classes emphasize practical strategies to reduce fear of falling and increase activity levels. You will learn to view falls and fear of falling as controllable. You’ll set realistic goals to increase activity, change your environment to reduce fall risk factors and exercise to increase strength and balance. One in three Americans aged 65+ falls every year. Falls are the leading cause of fatal and non-fatal injuries for older Americans. Falls are costly—in dollars and in quality of life. However, falling is not an inevitable part of aging. These classes, practical lifestyle adjustments and increased exercise can reduce your risks. These proven classes were developed by Maine Health’s Partnership for healthy Aging, and have been taught with successful results nationally. Two coaches teach small classes, no larger than 16 persons. Two-hour classes are scheduled weekly for eight weeks or twice a week for four weeks. Empower!You is expanding. If you would like to host A Matter of Balance or Self-Management Programs at your facilities, contact us. 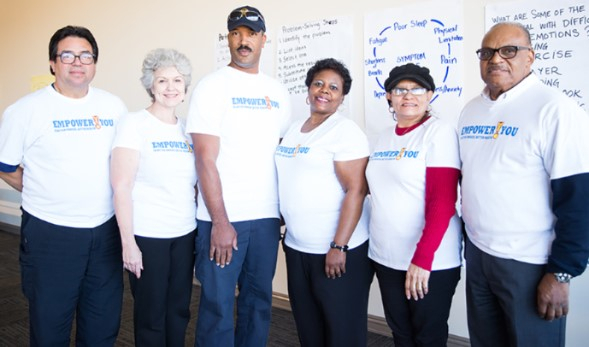 If you’re motivated to help older adults maintain their independence and live better lives, Empower!You provides a meaningful way to invest your time and help our community. You can refer your patients to either Self-Management Programs or A Matter of Balance classes.